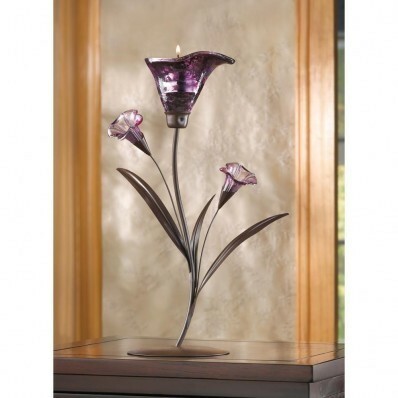 14575 Twilight Bloom Tealight Holder home decor, jewelry, decor, decorations, electronics, fountains, floor mats, art glass, vases, garden essentials, fireplace screens. A single dusky purple lily holds a tealight candle at hits heart, while crystalline flowerbuds capture the gentle glow. A beautiful reminder of the quiet enchantment as the evening turns to night!